some how i missed this post. sorry for delayed response. Direction of the marriage line is important to note if you want to know from which direction partner is. color of the marriage line proportionate with the complexion of the partner. if you have triangle sign on venus, indicates you will marry the maternal cousin. if the marriage line bends down and reaches the heart line under the sun mount, indicates register marriage (love marriage) . if a line raises from moon and conjoin with fate line, it indicates receiving the properties , gold and lands from the spouse's family. if the marriage line bends down and cuts the heart line , plus independent head line indicates marrying incompatible spouse. if the marriage line reaches till the sun mount, indicates marrying rich partner even if possessor may be pauper. straight heart line peoples prone to love for physical needs. likewise many. . When you say a line coming from the moon to meet fate line, could this also be from the racettes, indicating gain through married? I was once told that this line could also mean that you will marry a foreigner? It would be helpful if you could sketches of the above combination of marriage lines. What nightingale explained me about the raising line from bracelet line to fate line may be absolute. But, so far i have never seen those feature in anybody's hand, nor read it in any books. However, Reading and knowing about Bracelet line is still puzzle to many of us. That is the reason why i gave some references. Recently, i saw 5 sloping lines raising from moon, parallel to each other , joining nicely to the fate line, in one gentleman's hand. He was 40 and unmarried. If a Line begining from moon to fate line indicates love marriage and getting wealthy as concerned by predictive palmistry. But, cheiro states that in the hand of women, this feature indicates getting wealthy partner. In the hand of males, it indicates getting help from other out of caprice and whim. Hence, the interpretation should be getting wealthy partner and love marriage. 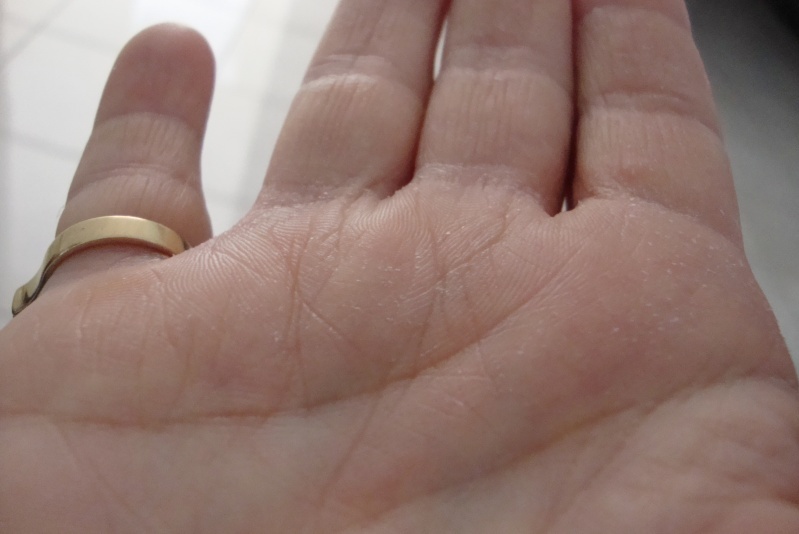 In this case, we have to be careful in examining the general color of palm lines. pink color palm line is favouable all the while. Again , it depends on the race and ethnicity of the individual. secondly, we have to be careful to note whether this line is being downward branch of fate line or raising from moon mount. If you find more than 2 such lines joining fate line, you have to consider it as downward branch of fate line, indicating that getting lots of debts for leading life. so, we have to be careful in our reading..
Hmm as you said , I have some of the features. this part is new kind of information. signifying habit of doing excess of addictive things. About Love Marriage I had read about it in an Astrological Magazine (Indian) where one Palmist gave one indication and this has never gone wrong. 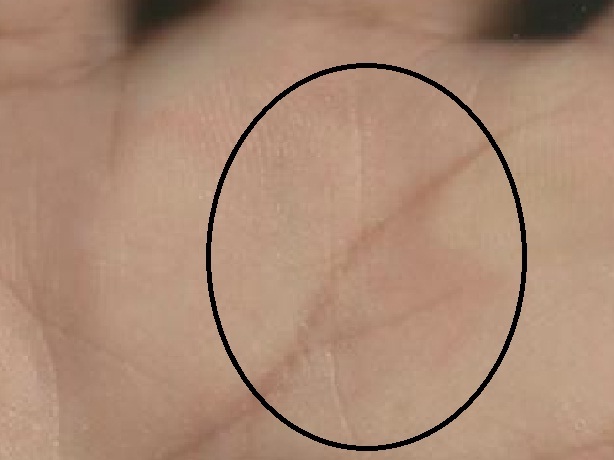 It is a short vertical line on the heart line below the Saturn Finger. I have always got this indication right. I have never got negative feedbacks for this reading. The one thing that puzzles me is that only 2 couples actually married leaving their parents and settled separately. Their parents did not support their marriage, whereas in all other cases the boy/girl approached their parents and discussed with them and got married in arranged marriage. In this case it was always the boy or girl took the initiative and it was their choice and hence Love Marriage. There is another indication which comes out right, but I cannot be always sure, is the independent Head Line. I read it as a person who will be independent in his choice of his/her partner. This is how I reason it. Love marriage (I am referring to Indian Culture) requires first confidence in your ability to go it alone in case your parents do not support it and hence Independent Head Line helps. As for fate line coming from Mount of Moon and either merging into the fate line or running parallel to it also indicates a partner coming into your life who brings you good luck and fortune. I have that indications and though I did not get any wealth from the spouse family I was already earning very well and after marriage my business shot up. Immediately where the fate line from moon merges into my other fate line , Sun Line starts and hence I interpret it as Mahalakshmi has entered my life. Fate Line coming from Mount of Moon has other interpretations also but the above is the often seen ones. Public Favourite is another, a person who has become famous by acting in Plays, A famous Actor etc. etc. also have this indications. thanks thats very informative! how would you predict a possible age for such union?? i have read that that closer the horizontal lines in the mercury mount are to the heart line, earlier is the 'marriage' per se. however is there anyway the fate line and or life line can help predict the age of marraige?? I have seen fate lines with indicators of marriage. 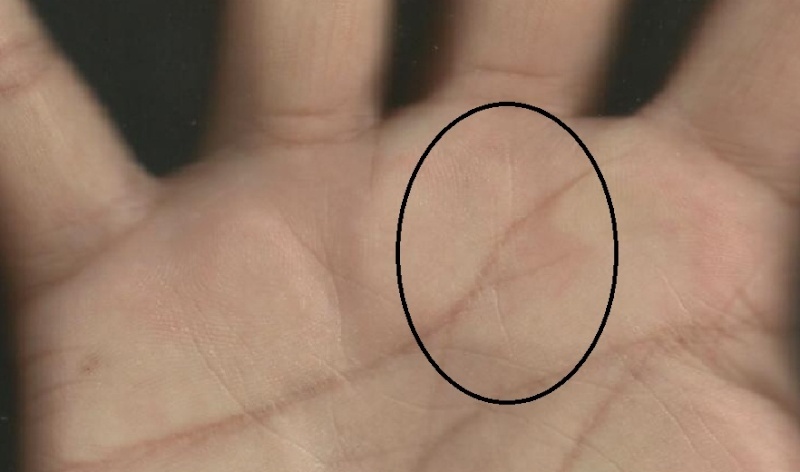 There usually is a line connecting from the luna side which may look like a drooping fine line from the fate line. Where this line connects to the fate line (based on the age range of where it connects) can indicate a time of marriage often used to confirm other indicators. If this line does not connect, shows a failed attempt. If a fate line coming from Mount of Luna meets another fate line coming from life line or from below near the rascatte it need not indicate the age of marriage in all cases. I have been deceived quite a few times in predicting that to be the marriage period as I have the same indication in my palm. One beautiful young girl of 25, whose palm I saw, had this indication. In her palm the fate line from mount of luna met her own fate line at 27 and I said you will get married at 27. She smiled and said she was already married at 22. I wondered why she had come for meditation classes, where I met her, if she was happily married, as this indication should indicate? Then I told her that probably there is some gap or misunderstanding between her husband and herself because of inlaws problems and that will be over by 27 . So other confirmations to match this meeting of two fate lines is necessary. Thanks, I understand what you are saying. This line I refer to though has to be examined carefully, because it is not an extra fate line, but usually a fine connecting line much similar to an interferance line. The ages on a fate line (so I have found) is also not exact. I would say a five year guess is accurate, so in this womans case, it would have been that she be married somewhere around the age of 22-27 or even 21- 26 etc. This is because not all fate lines are the same, some have bends, some are weak with obstacle lines which often slow down the progress of the person, others are deeply etched, giving the timing of the line different especially between men and women. Can you provide the link to this book? you can read this book online through the following link. you can find the link to download this book in pdf format through googling . I dont remember the link. If you are not able to find the link, contact me. I have the soft copy of this book. mprusty wrote: It is impossible to predict whether one will have love or arranged marriage. At the same time it is also not possible to forecast as to love marriage from study of palm reading science. How do you know? just curious. What if a person has several lines rising from heart line to Saturn? Some longer than others, would you choose a small one of these as the marriage line? Or how would you interpret or decide which is 'small vertical line', sorry I mean how small should it be? I have never found more than one short line touching the heart line on the top and going towards Saturn Finger but if you find more than one then look at the number of relationship lines also. You may find many vertical lines above the heart line, not touching the heart line or these lines may come from just below the heart line. I have verified this method since last 20 years and have never failed. The only difficulty is when the prints are not good it is sometimes difficult to say whether the line starts from above the heart line and touches it. What would your comment be about these lines from the heart line or not? This one may be clearer. The third line from the right side appears to be near about the line I describe but I see it to be starting from just below the heart line. If you are sure it is from above the heart line then it will indicate love marriage though I always see it as a short line. I have done a little further study on this and tend to agree with you if the line actually comes from the heart line like a branch and rises toward the mount. These lines I indicated above don't seem to do that. Branch of a heart line will be curved whereas I am referring to a short vertical line. About 4/5 days back I read one palm in www.mysticboard.com (Palmistry Reading Forum) of aries where this person confirmed my reading. I emphatically said you will definitely have Love Marriage. You can see the images over there. so my dear you can say that this sign of love marrige ?????? ?